Graham Peak sits at the southern end of the Albion Range above the City of Rocks National Preserve. Eastern approaches to the peak are blocked by private land but the peak is approachable from the National Preserve by trail and the west and north via old roads which are gated shut but open to self propelled travelers. 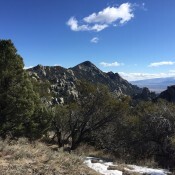 The views from the top of the City and Cache Peak and Mount Independence as well as the Black Pine Range to the east and Utah’s Raft River Range and Pilot Peak help make this peak a special place. 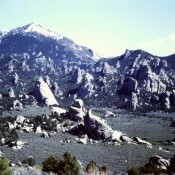 The City of Rocks with Graham Peak towering above it. 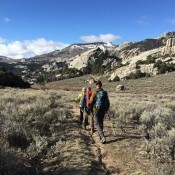 The trail approach from City of Rocks crosses well maintained and signed trails. 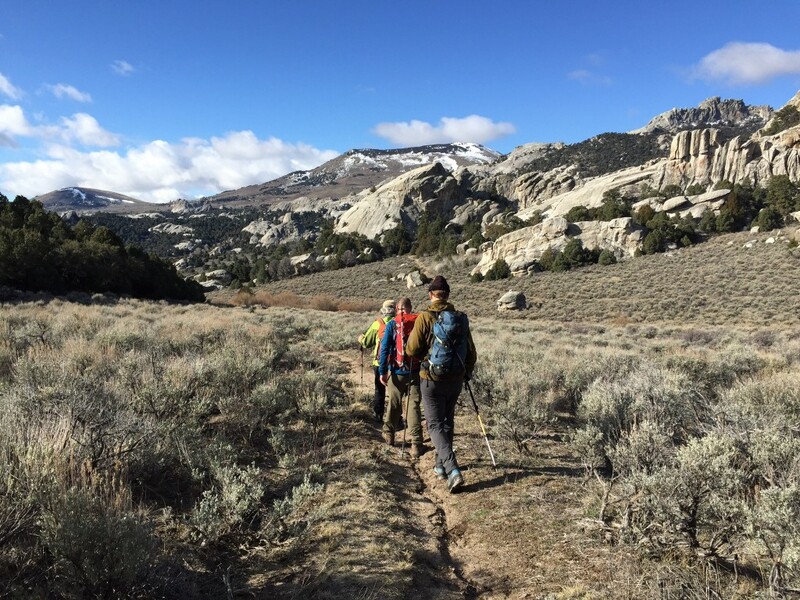 Hike to Indian Grove and then choose a Class 2 route that looks good to you. The sage covered slopes are difficult because the brush is very healthy. Climbing up through the trees worked for me. 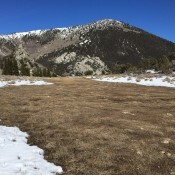 It is possible to follow a road/trail from Indian Grove to the summit (see Hannah North’s note at the bottom of the page). 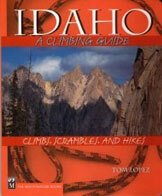 Its a longer walk than the 7.5 mile walk/scramble shown below. Also see John Platt’s trip report linked below. 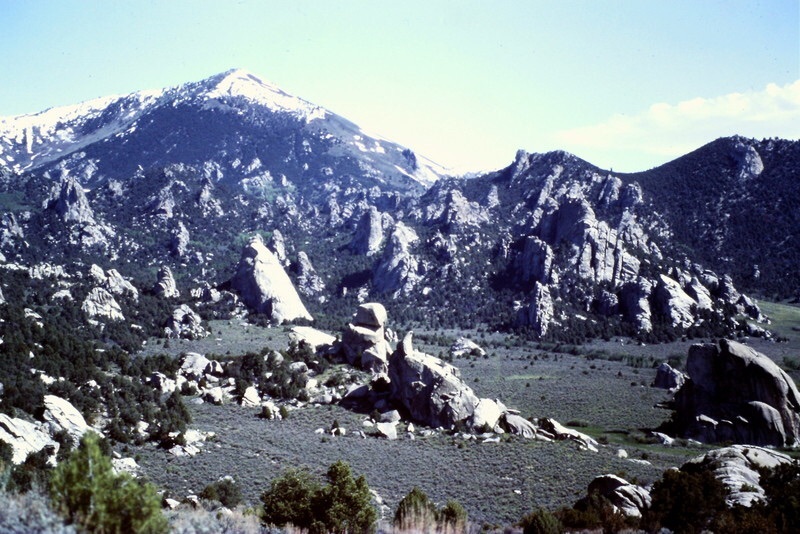 Approaching the peak from the City of Rock will take you past many amazing granite formations. On the trail to Indian Grove. Granite Peak,viewed from the trail to Indian Grove. The west face from a point just south of Indian Grove. The southern trail approach from the City abandons the trail/road system at Indian Grove and climbs the peak’s west face in 7.5 scenic miles. Elevation profile for southern approach. There is a trail to get a person all the way to the top of Graham, but we didn’t send you up because it has too much snow. It’s called Skyline Trail. It goes from Indian Grove up around SW side of Graham. The Park Service maintains this section of Skyline Trail pretty well. Then from Graham Pk the trail goes north along the length of Albion Range to near Pomerelle Ski Area, maybe 70% single track and 30% dirt road. It’s a very scenic trail, I’d guess about 25 miles long. 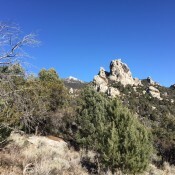 Except for City of Rocks section Skyline is not maintained by USFS so has deadfall. Ok for hikers but not cyclists or horses. Only portions of the trail still appear on topo maps but more of it is still there. FSR-562 is called Logger Springs Road. It does skirt the western slopes of Graham Peak “to within 200 feet of the summit”, but that statement is misleading. It should read “to within 200 VERTICAL feet of the summit” as it is at least a ¾-mile cross-country scramble from FSR-562 to the summit. The USGS topo map incorrectly places FSR-562 higher on the west slopes than it actually is. The road never gets higher than 8,387 feet. It reaches this crest at its junction with FSR-607/StinesPass Road which, coincidentally, is about where the “old road to the top of Graham Peak” starts. So, in reality, the road never gets closer than almost 500 VERTICAL feet from the summit of Graham Peak. 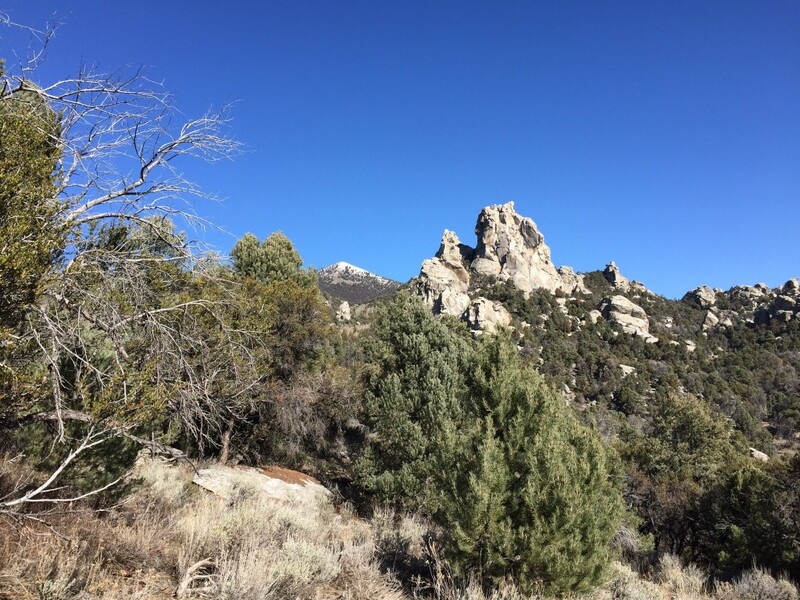 From the junction of ID-77 and Elba Road/1950 South in Elba, drive 12.7 miles south on ID-77 (passing through Almo on the way) to a signed R/W turn for the City of Rocks National Reserve at 3075 South. This paved road is unofficially called the “City of Rocks Road.” Set your odometer to 0.0 here. Turn R/N onto Logger Springs Road and reset your odometer to 0.0 here. 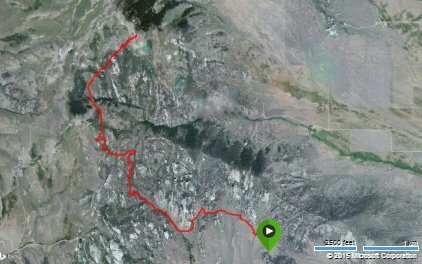 Drive up the steep, but smooth, road for 2.8 miles to reach the Sawtooth National Forest boundary (signed). 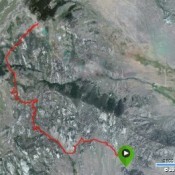 At about 4.3 miles, you reach a signed road junction at 8,387 feet. STRAIGHT is Logger Springs Road/FSR-562; RIGHT is StinesPass Road/FSR-607. Go RIGHT and park at the base of FSR-607. Walk about 50 yards to another road junction. STRAIGHT is FSR-607; RIGHT is Graham Peak Road/FSR-707. This is where the hike begins. 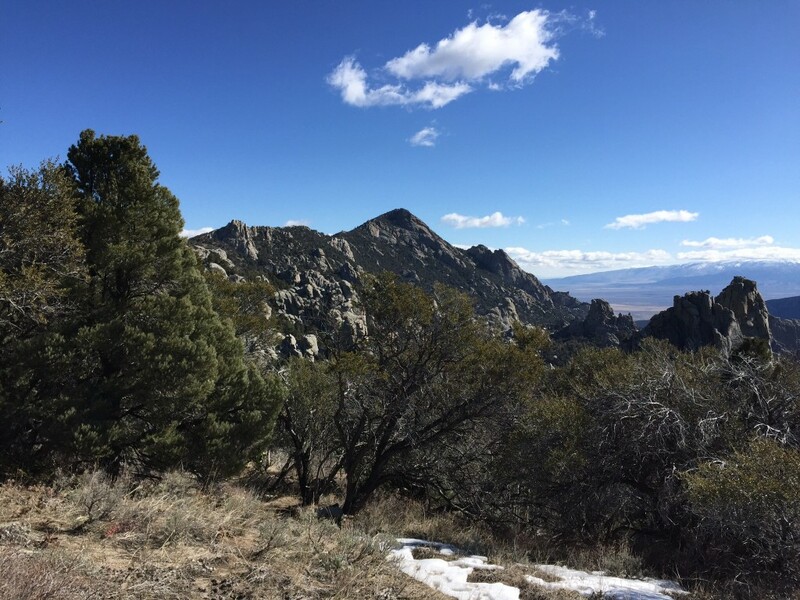 Hike up FSR-707, a rocky jeep road, to where it ends near the summit at a minor ridge saddle. Do a short, Class 2 scramble SSE to the cairned summit on an easy mix of broken rock and short scrub. You will find a repeater antenna on the summit as well. Most of this hike is Class 1. Same as for the Northwest Face/Northwest Ridge Route. 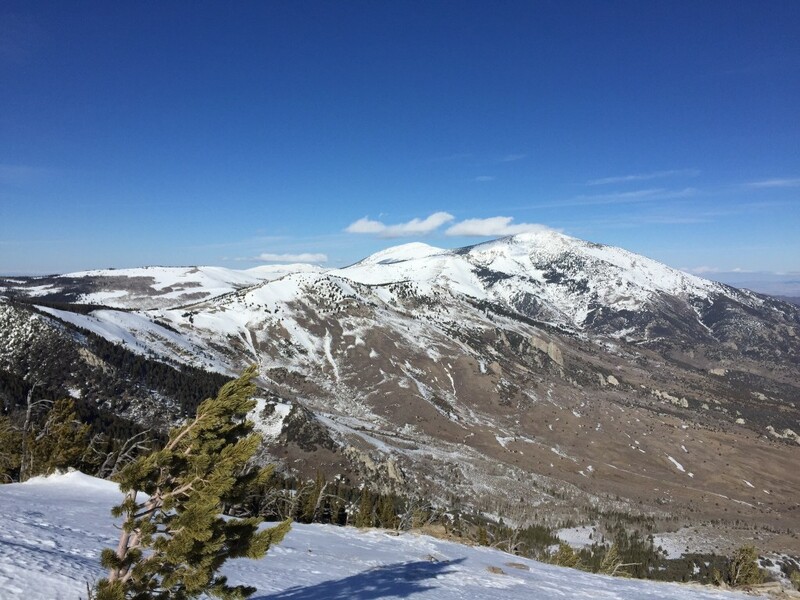 This route is part of a ridge traverse from Graham Peak to Peak 8770 (Stines Peak). From the summit of Graham Peak, scramble NW then N along the North Ridge to reach Point 8648. 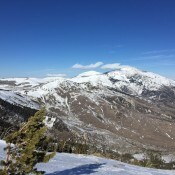 The North Ridge is mostly open terrain with broken rock and easy, short scrub. Skirt L/W of any ridge crest issues (e.g., thick firs) and use good cattle trails on the upper edge of the thicker veg to help you advanced quickly. Soon after passing Point 8648, you reach a flattish open area with a fence row and an old jeep road coming up from the thick pine forest to the west. This old road is FSR-607A, which you will encounter when you descend Stines Pass via Stines Pass Road/FSR-607. The fence row is a navigational dream in your effort to descend to Stines Pass. Better yet, the fence is shown on the USGS topo map. Follow the R/E side of the cattle fence as it descends down through a thick pine forest (with a finish in a short section of thick aspens). The footpath alongside the cattle fence turns into an old, overgrown jeep road with blowdown criss-crossing it at various points. The road doesn’t quite get you to the pass, but it gets you pretty close. Bash your way through a section of aspens to reach a rocky outcrop that sits just SW of Stines Pass. You might think that THIS is the pass, but it’s not. You will notice a good jeep road to your L/NW here. That is your ticket back to Logger Springs Road. Continue NE from here, either skirting or climbing over the minor ridge bump to reach Stines Pass. The cattle fence is in pretty rough shape at Stines Pass. 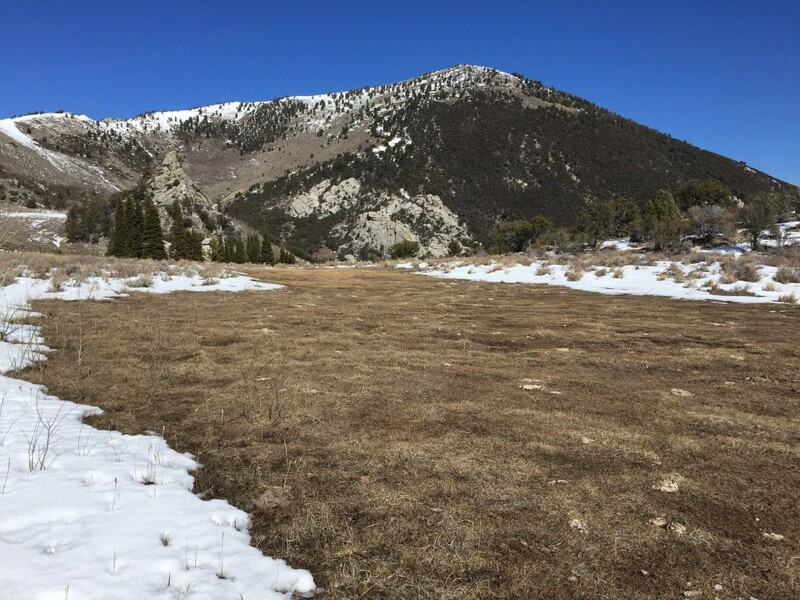 It is laying on the ground to the L/NW of the pass and it continues, at least temporarily, up the Southwest Ridge of Peak 8770 (Stines Peak).